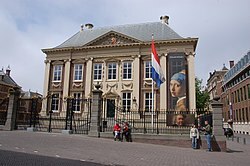 The Mauritshuis (Dutch pronunciation: [ˈmʌurɪtsɦœys]; Scots: Maurice Hoose) is an airt museum in The Hague in the Netherlands. ↑ "The Mauritshuis is turned into a museum". Mauritshuis. Archived frae the oreeginal on August 23, 2006. Retrieved 2008-08-08. ↑ Address and directions, Mauritshuis. Retrieved on 16 June 2014. ↑ Search the collection, Mauritshuis. Retrieved on 16 June 2014. ↑ Successful inaugural year for Mauritshuis (press release), Mauritshuis, 2014. Retrieved on 23 June 2015. ↑ 5.0 5.1 Who we are, Mauritshuis. Retrieved on 16 June 2014.